Patagonia is a company that has as far back as I can remember put the environment high on the list of their priorities and has become kind of a synonym for an environmentally aware company. They have been that way long before that was “the cool thing to do” (like it is today), and they stayed on the frontline of the eco movement until today. For instance – Patagonia was one of the “1% For the Planet” founders. 1% for the planet is an alliance of companies that commit at least 1% of their total sales to the environment. Patagonia gives 1% of their total sales or 10% of the profits, whichever is more. And Patagonia wetsuits are as environmentally friendly as they can be. Patagonia was founded by Yvon Chouinard in 1972 and is based in Ventura, California. They are not strictly a wetsuit company, they started as a clothing company which mainly focused on outdoor clothing. From there they have spread to other fields including wetsuits. How warm are Patagonia wetsuits? 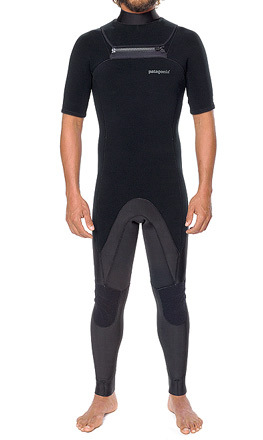 a wetsuit that has chest/back 5mm, legs/arms 4mm, hood 3mm neoprene lined with chlorine-free merino wool in 38-48° F / 3-8 C water. So far I did not have the chance to try one of the Patagonia wetsuits and test their water temperature and wetsuit thickness chart. If I come across a Patagonia wetsuit I’ll post a review in the wetsuit reviews section. The site has links to the new patagonia boots listed on the FDC (Fletcher Chouinard Designs) site and a Five Finger bootie R&D discussion. If you like the product, Voice your opinion via the fcdsurfboards.com link listed on the review. I have a Patagonia 3 mm suit. I wore it last year in San Diego all winter and this year in Santa Cruz. In San Diego I did not need booties at all. In Santa Cruz, I wear 5 mm booties with the suit. I might pick up a hood for extra chilly days, but so far this suit has kept me warm.